Our speaker for the evening was David Phillips who, for the past four years, has been taking small groups of people on trips to Iceland to see one of the wonders of the natural world known as the "Northern Lights". The more scientific name for this ephemeral phenomenon is the Aurora Borealis after the Roman goddess of the dawn (Aurora) and the Greek name of the god of the northern wind (Borea). David works for a company called Explorers Astronomy Tours who specialise in worldwide astronomy holidays to see solar eclipses, meteor showers, aurorae, astronomical observatories as well as observing the night sky from dark sky locations. The atmospheric effect that we see as an aurora occurs around both of the Earth's geomagnetic poles but is normally recorded in the northern hemisphere purely due to more people living at the higher northern latitudes. In the southern hemisphere it is known as the Aurora Australis or Southern Lights and is normally only visible from high southern latitudes in Antarctica, South America, New Zealand and Australia. Interestingly, the aurorae form a ring-like shape with their centres on the magnetic poles of the Earth and not the geographical poles. At the moment the northern geomagnetic pole lies in the Arctic Ocean and is moving erratically but relatively swiftly over the years past the geographic North Pole and towards Siberia. The light show that is an aurora is caused by charged particles from the solar wind colliding with atoms high in the Earth's atmosphere. They are more common when the Sun is at the peak of its solar cycle, as it is at present, and it ejects much more material into space and towards the Earth. The Earth's magnetic field then guides these charged particles down its magnetic field lines and towards each pole until they collide with atmospheric atoms. This collision energy is absorbed by the atoms making them take on an unstable state. To regain its equilibrium each atom gets rid of this excess energy by emitting a photon of light and it is this light that we see as an auroral display. 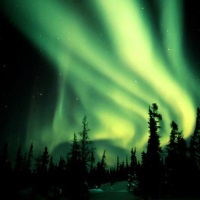 Auroral displays can vary greatly depending on the density of the solar wind, ranging from a dim glow across the whole sky to discrete sheets of waving bands of light that are often compared to billowing curtains overhead. Observers just using their own eyes will not see the brilliant reds, greens or blues that only a camera can capture but will see more of a greyscale scene with pearly-grey hues. David said that the best way to capture an aurora on camera was to use a tripod and wide-angle lens with the white balance setting on daylight. Then open up the aperture as far as possible (i.e. use the lowest f-ratio) and set the ISO to 800-1600 with an exposure time of 5-20 seconds. It was also useful to remove any UV or polarising filters. More importantly, a prospective auroral photographer would need to be near or within the auroral oval with clear skies and at a time of New Moon as moonlight would drown out any of the subtle effects.